After years of hard work, stress and student antics, you’ve finally finished your degree! 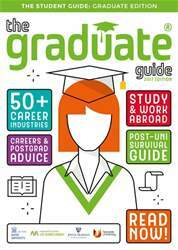 Some graduates will already have their next stage sussed; but for those of you who are fed up of hearing ‘what are you going to do now?’, and panicking because you haven’t figured it out yet, this is where The Graduate Guide can help. Providing all the advice you need, covering everything from postgraduate study options to career industries and opportunities overseas, you’ll soon have a much better idea of which direction to take.